One more useful option – Recover deleted records. If you have deleted records in the table, and then scan database using this tool, without compacting database – you can also recover deleted records. 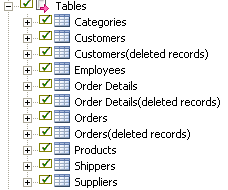 Tables, with deleted records appear as separate tables, like on then picture below.